The Traveling Gnome is the smallest in the Gare gnome family, but carries with him an important gnome accessory, his suitcase! This gnome doesn't stay put, he travels in his spare time! 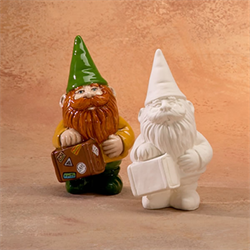 Have fun with this gnome in your kids camp classes and add him to your party room selection, he's the perfect size for both and his suitcase is fun to decorate with places of interest.